* Special construction — won't scratch or mark your floors! * Solid core — no holes or hollows for your favorite spider to live in! * Lightweight - only 10lbs! Use a scrub brush with soap and water or if on the road use WD-40. Spray WD-40 on and wipe it off with a clean rag. 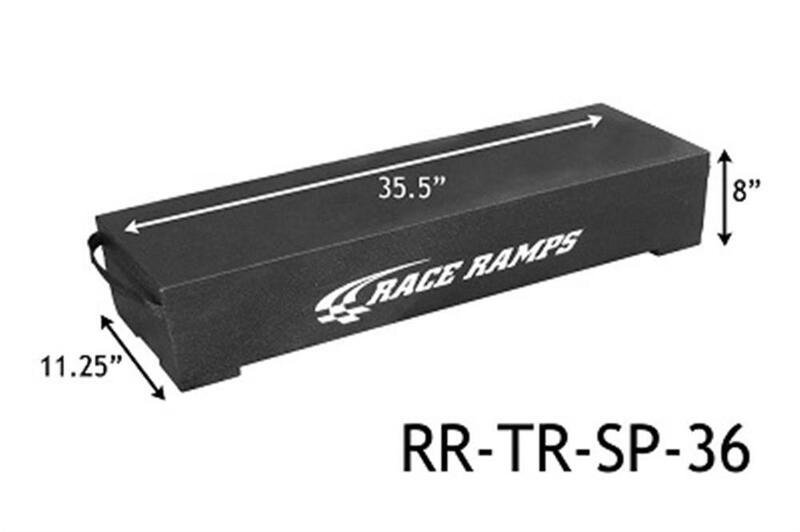 Race Ramps can be used indoors or outdoors as long as the surface temperature of the ramps does not exceed 150° Fahrenheit (65.56° Cesius). 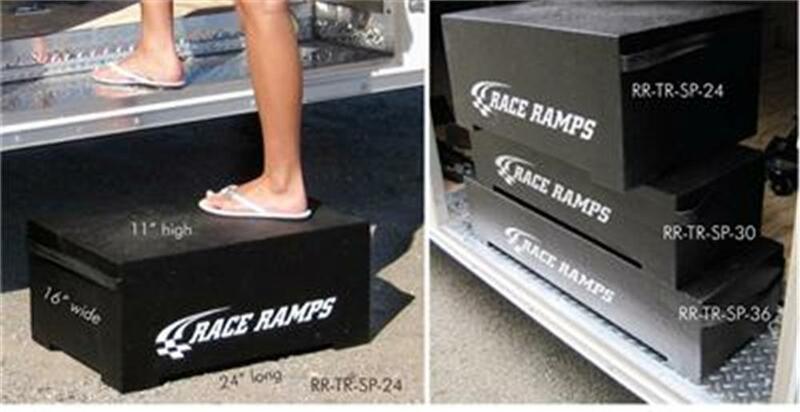 When using Race Ramps outside avoid exposing them to direct sunlight for a long period of time. In warmer climates, do not store them outside or in the trunk of your car. Race Ramps are impervious to most automotive fluids. However, some fluids may penetrate the ramps if left on the surface area for prolonged periods of time. Other fluids have been known to stain the ramps if not immediately removed! a) Work with cars that have high-performance, high-speed rated tires. Do not use them with heavy lug mud tires or extra narrow tires. b) Support 1,500 lbs. per tire, per ramp, by spreading the weight of the car over the entire width of each ramp. Do not drive over the front or on the side edges of Race Ramps or the edges of the ramps may crush. c) Be placed on a flat surface. Do not use Race Ramps to bridge a large gap. e) Be kept in temperatures below 150° Fahrenheit (65.56° Celsius). 2) There may be a slight impression (up to 1/8″) left on the surface of Race Ramps caused by the vehicle tire weight settling the inner core of the ramps. This is normal. 3) When using Race Ramps on cement or asphalt, it is best to sweep the area first. Rocks and debris left under Race Ramps can act like small ball bearings and may cause the ramps to slide and may cause denting and pitting of the ramps. 4) We do not recommend using wood, metal, or any other materials with our ramps. Contact our tech support group (866)464-2788 or support@raceramps.com if you are having issues with our ramps or loading. Race Ramps purchased from an authorized dealer or directly from Brute Industries, Inc. are backed by a one-year warranty. Our warranty is strictly limited to the repair or replacement of manufacturer defects and does not cover damage to a car, personal injury, labor, or any other damage or injury. Brute Industries, Inc. is not responsible for the damage caused by improper or unintended use. In no event shall Brute Industries, Inc. be responsible for consequential damage or costs. The warranty shall terminate one year from the date of purchase by the original owner and is not transferable. Because we are continuously conducting research and development, specifications are subject to change without notice. Those items sold by Brute Industries, Inc., but manufactured by other companies are subject to the manufacturer’s warranty and policy. Exclusions to this warranty are damage caused by heavy lug mud tires, from driving on the edge of Race Ramps, using Race Ramps as a bridge or exposing them to temperatures above 150° Fahrenheit (65.56° Celsius).